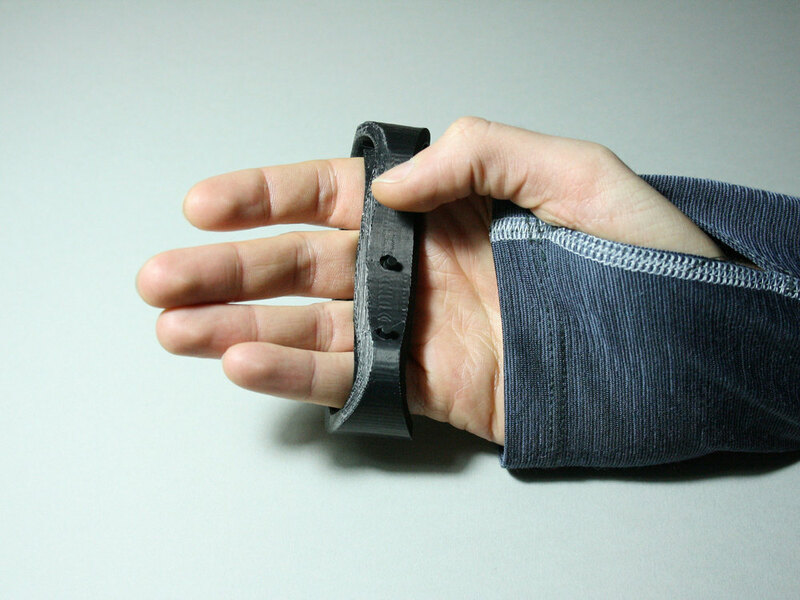 This concept explores challenges with current wearable products from an ergonomic and human factors standpoint. With the growing number of wrist-worn activity trackers, many fail to consider the context of use. As a case-study I created a functional wearable music remove which can be operated one-handedly while performing physical activity such as running. The prototype was created using Arduino and a 3D-printed shell, together with an app app made with the help of open source code. This product was tested in-situ. The findings were positive however this product would require further development and better integration into user's current product eco-systems. Prior to the start of this course a project proposal was submitted. My proposal was for a communication device to aid mentally disabled people. This phase of the project explored this field and others in more detail and expanded into other types of tangible interfaces or physical computing concepts. 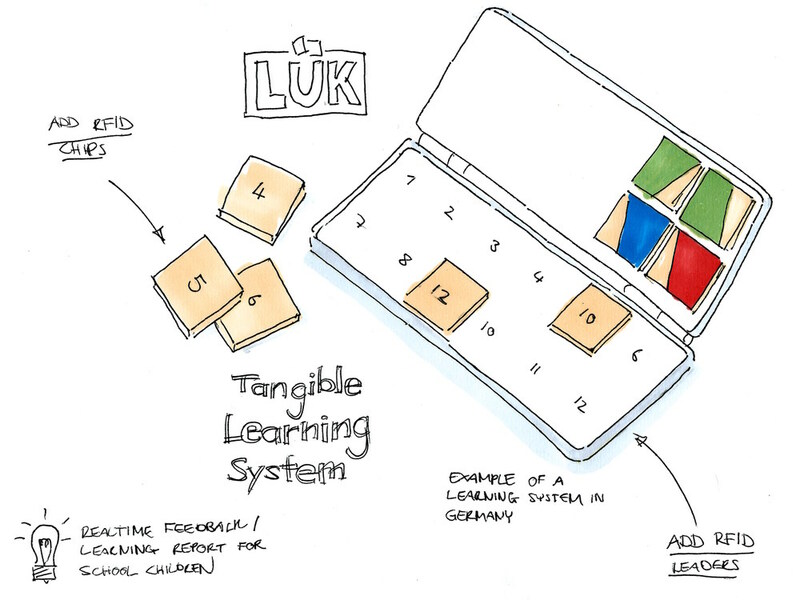 After exploring tangible interfaces and physical computing, themes emerged which helped to defined three concepts around learning, tangible input and tangible output devices. 3 concepts were explored and developed in parallel and after multiple design iterations one was selected and taken forward to prototype. This device is a tool to enable those with speech difficulties to communicate their needs via tangle objects. Tactile bluetooth / RFID-enabled ‘pictograms’ would trigger a text message or notification. This concept takes the previous concept further and more towards learning. Objects can be used to either teach children about colours and shapes, or even to learn vocabulary. Tangible connected objects provide analytical data on the person’s learning. One of the benefits of today’s developments in physical computing are the size of components and the possibilities of integrating them into wearable products. This project explores the personal computing space. I explored multiple wearable products, starting with the placement of the human body to designs and functionality. Inspiration was taken from the Alexander McQueen Knuckle Clutch with its unconventional handle. Both conventional and unconventional ways to attach a product to the human body were explored as shown below. Looking at the design and aesthetics of the device was also touched on during this project as there have been many attempts by designers, and even users, to personalise personal monitoring devices. To aid the concept development phase I used polymorph to rapidly build mockups of the design in order to test and explore the concept in more detail. 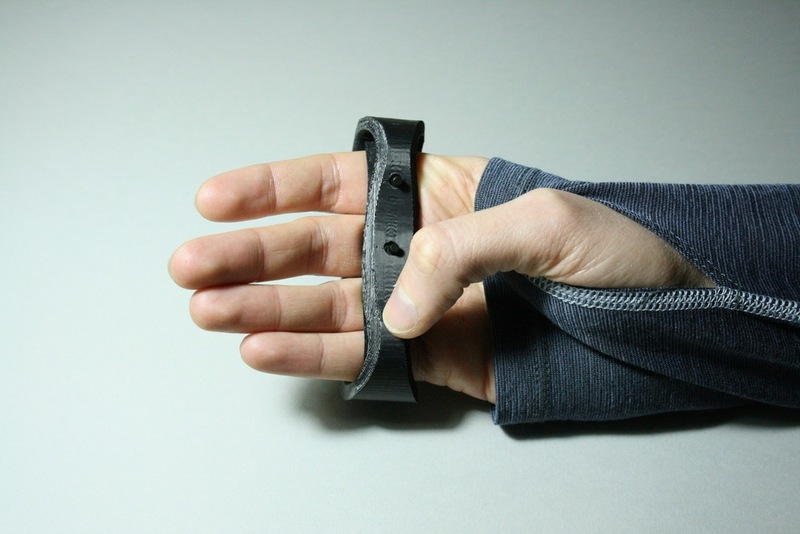 Whilst watches and other smart wrist bands are currently being explored by many companies, these products require attaching to the arm and to be operated by the opposing hand, making it a two-handed interaction. During physical activity, such as running, this may not necessarily be possible. 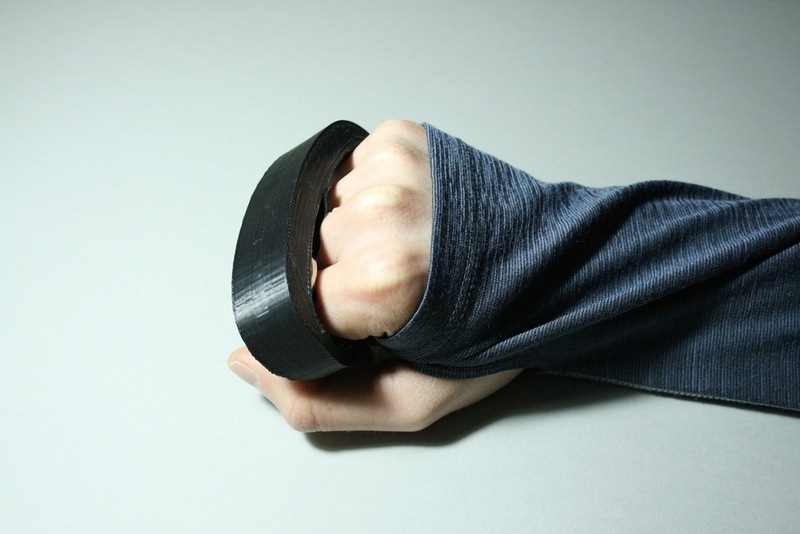 Additionally, much sports attire has been designed to cover the user’s wrists, making them inaccessible. Designing something which covers just the fingers and is accessible by the user’s thumb allows for a one-handed interaction. 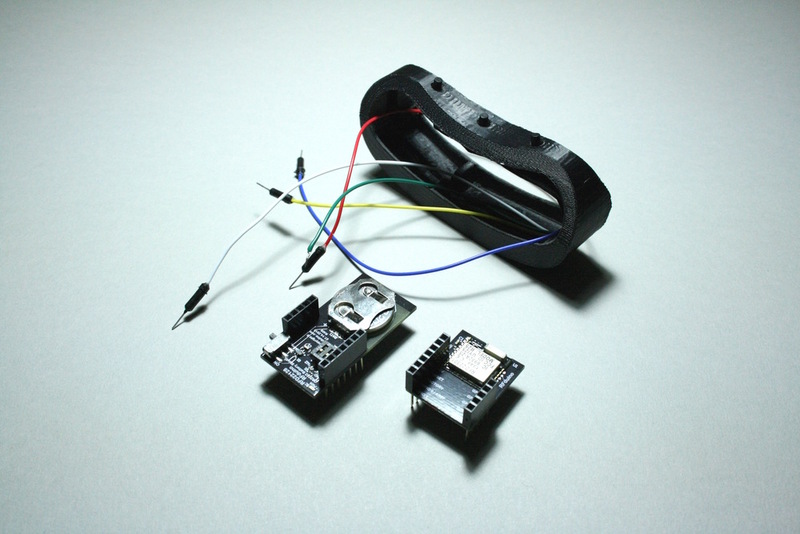 RFDuino shields were used to create a working prototype of the product. This allowed me to define the components required for building the product. Some of the shields such as the LED/button shield were replaced with individual components. The components and basic programming was tested with an Arduino Uno. Once complete the code was adapted to the RFDuino. The wired connection was replaced with the RFDuino Bluetooth serial connection. The product went through many states of iteration until a final RFDuino prototype and an iOS app were built. This product also uses sample code taken from Github. Starting with basic paper models, the shape of the product went through many states of interaction. Initially the designs focused on the form factor and user comfort. Throughout the process the model was designed to consider its internal components. This was prototyped with both foam core and blue foam. The blue foam models were tested and refined until a satisfactory shape was found which was converted into a British Standards (BS8888:2013) engineering drawing. Multiple digital fabrication techniques were explored. However 3D printing allowed me to design an organic shape which would be more comfortable while using or testing this product. Originally a a mould for silicon rubber was considered, but for early stages in the prototyping phase this would not have offered any benefit other than its flexible material properties. However, the flexibility may have caused additional challenges when integrating electrical components. The platform used to prototype with was Arduino, the RFDuino in particular, as it includes a built in Bluetooth Low Energy module and is small enough to integrate into a wearable product. Both 3D-printing and Arduino allowed for an iterative design process. The engineering drawing was converted into a 3D model in Rhino. After creating the curves the model was converted into a mesh and exported to an SDL file which was then printed. Below is the process from paper, to foam, and finally to a 3D printed model. Once the model was printed the functional Arduino prototype was placed within the printed form factor and the buttons were wired at their correct location.It was later tested outdoors while running and at the gym during physical activity. Using Bluetooth 2.1 with AVCP profile will allow the device to function with other music apps.